I'm wishing you all the best with your challenge :) Nice jersey dress and yellow purse! That red dress is so flattering on you and I love how you paired it with those ankle boots. I love that first dress. The burgundy color and its style (like a Bohemian) is beautiful. The canary yellow is such a pretty tone and love how your paired it with red! Such a wonderful cause to participate in! You always look beautifful wearing anything you want! Your inner beauty always shines through. Not that I don't like what you are wearing, of course I do! Both dresses are super cute and fit you really well and the yellow bag is the perfect accesory to add the right amount of color to any look. Hugs and kisses to you my friend. I love the maxi dress but can't wait to see what else you get instead! Have a blessed week! Yes I'm looking forward to swapping it for something I'll love even more! The maxi and the jean jacket look lovely - as the shorter red dress. Yes, and anyone can set their own dress challenge! I decided to try wear a different one every day, but some of the ladies in my team are just wearing them once a week, or just to the office. Something to have fun with and fund-raise for a great cause too! That yellow bag is the perfect pop to any outfit! I think you made a good choice about the maxi dress. While it looks great on you, you have a large collection so one less won't affect your closet too much! Very true! I have a large collection of everything at this point, ha! Need to downsize definitely! It's a fundraising event for Ovarian Cancer Research Foundation, it's a wonderful cause to participate in! I really like the mustard and burgundy together in the first outfit! I haven't tried that color combo before! And your colorful accessories are adorable with the second dress! Love how you added a beautiful yellow bag to both looks. I love those ankle boots and that maxi! So cute! I love that maroon patterned dress! SO cute, and it looks awesome with that yellow Swing! I am seriously drooling over your Minkoff collection, it's the best. I do love my Rebecca Minkoff bags! You have the best bags. One of your Louis Vuitton bags still remains one of the most repined images on my Pinterest! The statement bracelet from your bestie is such a cool one. I love you dressed up both outfits with the bright yellow Rm! It is very cool! I'm so lucky she got it for me! I like the striped maxi, but hopefully you'll be able to replace it with something you love even more. That dress in your first look is gorgeous! 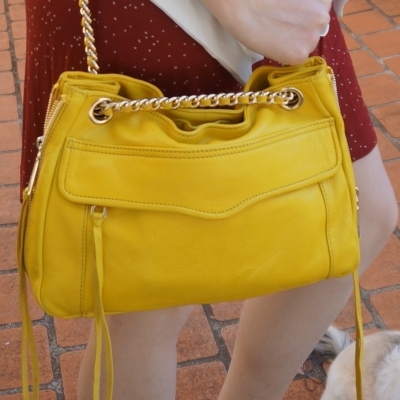 I love the dark red color with the bright yellow bag! Though I like how fun your second look is, Mica I've felt in love with the first one. I remember having the same colored dress many, many years ago. Beautiful styling with the light jacket and Chelsea boots. You've been busy with the challenges! Hehehe! I love seeing your looks though. The last outfit reminds me of Americana. Just missing some stripes. But the first look I am seriously crushing on. That yellow bag is perfection. I have been! Trying to nail a few challenges at once, haha! I'm back and happy to see these lovely outfit post from you.. as usual, I love the bag! You look so cute in the first outfit. The bag looks great with both outfits! I love the statement bracelet! Love the initiative! Great dresses and love the bag! I love that belted jersey dress. It's a pretty color and perfect for maternity wear too. I cannot wait to see your new bag! I'm excited to wear my new bag! It arrived just the other day! Great color, this bag! loving the looks! I'm such a huge Rebecca Minkoff fan- her stuff is amazing! You have so many cute dresses! I love both of these. Can't wait to see more! that yellow bag is adorable...and it looks great paired with both dresses. That striped maxi is so lovely but I also really like the first one. You always look great. I LOVE this! I adore burgundy and mixing it with yellow, such a great combination! I really like the beach-y vibe of the second dress even though you're not going to keep it, it looks great with the flip flops. I'm sure you'll find an even better maxi to replace it. I love the pop of colour your yellow bag provides! All the best with your fundraising! Thank you! I'm hoping to meet the fundraising goals I set! FROCKTOBER! Wow, I've missed a lot but I love this idea! You are so creative with the styling of dresses - the second maxi dress look is my favorite! It is a great idea to raise money for an even greater cause! I'm thrilled to be a part of it this year! 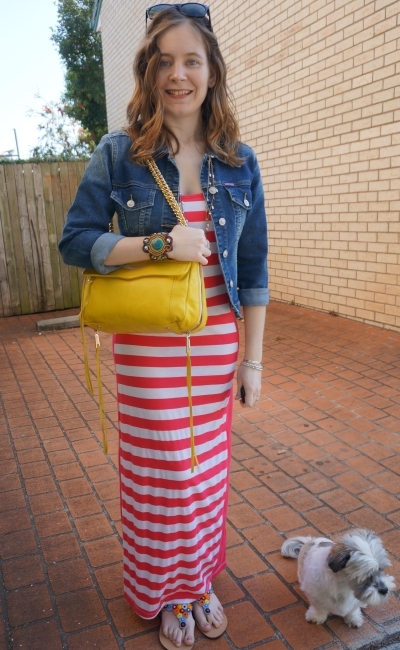 I love that denim jacket and striped maxi dress Mica! Looks so good! In love with outfit #2. That denim jacket is made for you. It is great to look fab while being part of a great cause. Love the denim jacket and your dog is always so cute! Oh, I'm so in love with that first dress! I love how the tie detail gathers fabric. It's so feminine!